Low voltage, high-speed drives and/or low inductance brushless motors require higher inverter switching frequencies in the range of 40 kHz to 100 kHz to minimize losses and torque ripple in the motor. 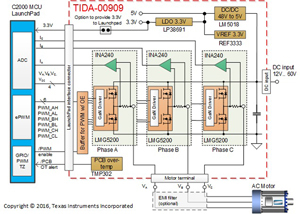 The TIDA-00909 reference design achieves that by using a 3-phase inverter with three 80V/10A half-bridge GaN power modules LMG5200 and uses shunt based phase current sensing. Gallium nitride (GaN) transistors can switch much faster than silicon FETs and integrating the GaN FET and driver in the same package reduces parasitic inductances and optimizes switching performance reducing losses, thus allowing to down-size or eliminate the heatsink. The TIDA-00909 offers a TI BoosterPack compatible interface to connect to a C2000 MCU LaunchPad™ development kit for easy performance evaluation. 3-phase GaN inverter with wide input voltage range 12V to 60V and 7Arms/10Apeak output current, tested up to 100 kHz PWM. 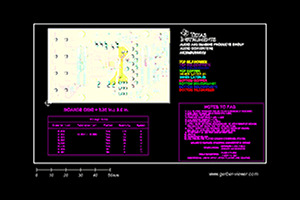 LMG5200 GaN half-bridge power stage ease PCB layout and reduce parasitic inductances for optimized switching performance, less than 2ns rise/fall time. 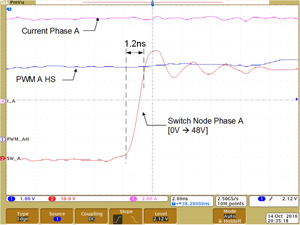 Very low switch node voltage over- and undershoot with very low 12.5ns dead band minimize phase voltage ringing, as well as reduce phase voltage distortions and EMI. Precision shunt-based phase current sensing with high accuracy (0.1%).